At this writing it is Holy Week, arguably the saddest week of the year. This week, my Lord dies, hope dies and we are left with nothing but the empty space of Holy Saturday. There is a commonality among the children at Haven House. Each time I sit with a child in spiritual direction, I first ask them to choose a picture of Jesus with children from a stash of many. This is our rhythm when they come. They choose the picture of Jesus they most need to see and then together we turn on a battery-powered candle to remind us that God is with us. Then they are invited to share their thoughts about the picture. Children who have heard Bible stories usually tell me something about Jesus’ death, even children who know little about Jesus know about his death. Some even know the gruesome details. The children at Haven House know death; they know emptiness, loneliness, and hopelessness. Often I will say, “Did you know, God brought him back to life?” Without fail, I am met with blank stares and even disagreement. Death they know, resurrection they can’t imagine. Hope lives in Jesus’ resurrection. The hope that says God is with you in your greatest pain. The hope that says God is with you even if you are buried under shame, doubt and fear. Welcome Home Party: Create a welcome banner for Jesus. Read the “Triumphal Entry” of Jesus (today’s reading) as a family. Enjoy special snacks; even invite the neighbors to join you in welcoming Jesus home. Create a Blessing Banner: Part of looking ahead from death to life is found in looking ahead from winter to spring. Use poster board and construction paper to make a ﬂower garden. On each of the ﬂower petals write a blessing or something worth living for. Use the poster as a Holy Week reminder that life triumphs over death. Till: We thank you, Jesus, for showing us how to live a humble and good life. Help us today to prepare for your coming. Show us how to celebrate your arrival! Water: Watch it: Watch for the love and life of Jesus today. Visit the Altar: In the sand, draw a picture of your favorite thing about Jesus. Weed: How did you celebrate today? How can you carry this celebration through to Good Friday? What's up with Holy Week? 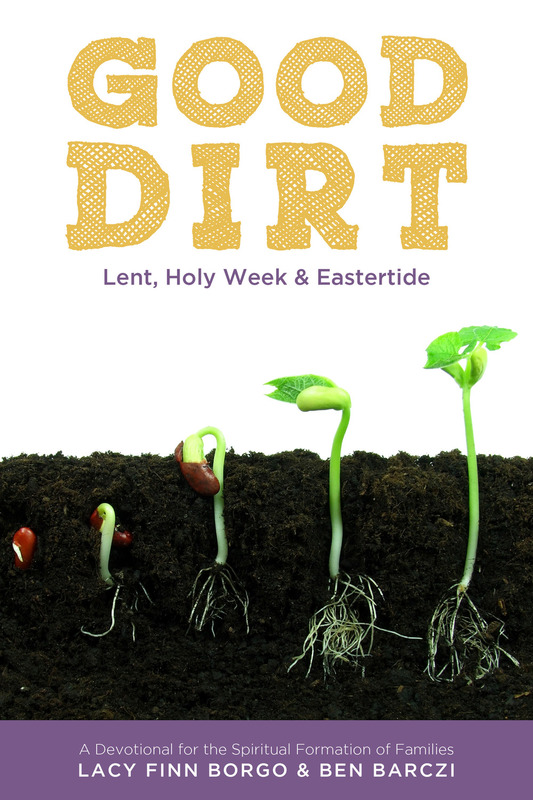 Excerpt from Good Dirt: Lent, Holy Week and Eastertide. Holy Week begins on Palm Sunday and ends just as we launch into the celebration of Eastertide. Holy Week places the divine/cosmic paradox we observe during Lent—death to life—under the microscope. We take a good look, with our hearts and minds, at how Jesus himself lived this paradox. As parents we may wonder how to explain the Christian mystery of death becoming life to our children. The blessing of ritual shows us the way. The small rituals already set in place during Lent and in each additional activity for Holy Week have a miraculous ability to impart understanding to children. Year after year these rituals teach the paradox of death to life. Their theology will not be complex, but children will know that out of death comes life. When children are young they relate best to the life part of the paradox. Spring is the breaking from the death of winter. Consistently pointing out all the signs of spring is a powerful reminder. Older children can enter in and participate in the death to life paradox. Always bring discussions back to the fact: “Life wins.” Older children can beneﬁt and will mature from time spent practicing dying to their own wills, and in sincere, thoughtful meditation on the last week of Christ in which he moved from life to death, and back to life everlasting. In what ways are you living the paradox right now? The following excerpt is from Good Dirt: Lent, Holy Week and Eastertide Till: Jesus, your ways aren't our ways. We have such a hard time with self-sacriﬁce, serving, and letting go of things we want even when they aren't good for us. Help us to trust you more. Help us to release control and follow you, even in hard situations. Imagine it: When Jesus told his disciples that his path was leading to suﬀering and death, they couldn't believe it! Peter even told Jesus to stop being so gloomy! Why do you think they reacted that way? How do you think you would have reacted? Enter it: Jesus’ way leads through suﬀering and loss. We have to follow him through it too so that we let go of the things that keep us from God. Tell about a time when you had to do something hard that you didn't like, but it turned out to be good for you. Apply it: Is there an area in your life where you need to give control to Jesus? What is one small step you could take today? Weed: What was hard today? How did you feel about it? What was easy today? Excerpt taken from Good Dirt: Lent, Holy Week and Eastertide Till: Jesus, you are with us and it’s a time to celebrate. Help us learn that you are better than anything we give up. Water: Enter it: In this passage, Jesus talks about fasting—giving up food or something else in order to focus on God. While he was here, his disciples didn’t fast because it was a celebration! What would it be like if you went to a birthday party, but refused to eat cake and acted really sad? How would the birthday person feel about that? Weed: How did your fast help you look for Jesus today? Or, if you are taking Sundays oﬀ of the fast, how did today remind you to rejoice in Jesus? Till: God, you made us, and you know: we’re made from dust, we return to dust. Thank you for being compassionate to us in our weakness, and accepting us in Jesus. Water: Play it: Encourage children to act out the parable Jesus tells in today’s reading. This will help them visualize what Jesus is teaching. Enter it: In this story, there are two men: one whose prayer focuses on his own goodness, and one who just asks God for forgiveness. Jesus says that the second man, who asked for mercy, was made right with God, and not the other. Why do you think that is? Apply it: God forgives us when we confess our sins. (Read 1 John 1:9). What would it look like today if you trusted God and admitted when you are wrong, instead of hiding mistakes? Weed: Lead your family in a time of confession at the end of the day. Where did you fall short of loving God and loving others? Be sure to thank God for his forgiveness. Then reﬂect: What was it like today, admitting mistakes instead of hiding them? How was it hard? How did it change your attitude? Prayer begins in the heart. Invite children to light the Christ candle in the morning or evening, or when you are reading the Bible as a reminder that Jesus is the Light of the World. This is the light of Advent that continued through Christmastide and Epiphany--and still shines on in Lent. Invite family members to visit the Altar at least once a day during Lent. Prayer Box: Take a 3x5 index card box and write prayers from the Bible, or from saints, or beautiful pieces of poetry on the card and place them in the box. Read one each evening before bed, or at the dinner table. Try prayers from This is What I Pray Today by Phyllis Tickle or Prayers for Each and Every Day by Sophie Piper. Fasting begins in our bodies. Fasting from Meat:Traditionally many folks fast meat on Fridays and they will also choose some other vice to give up for 40 days. If this works for you and your people, go for it. Fasting from Superfluous Foods: Others I know have fasted eating out for 40 days, still others have fasted sugar, or chocolate, soda. Fasting from Technology: For children giving up nutritional food is not an option, but giving up TV, or video games, or texting is certainly a good choice. Fasting is not popular in our culture. To deny myself something I want will sound strange to others, but it is imminently important that we and our children learn to tell our bodies, “No.” Letting our bodies and our desires run our lives will destroy us. Fasting is directly related to prayer. We will need strength beyond ourselves to die to our wills. The will is loud, and irritating; only the peace of God can quiet it. Fasting is directly related to prayer. In fasting we teach our wills to ignore our mere desires and focus on our true needs. But the will is loud, and irritating, and is the habit of responding to the body's wants. We need strength beyond our own to die to our desires and retrain our wills. Only the peace of God can quiet the will long enough for it to learn. Giving begins right where we are. We look to our families and see where we take instead of give. We make the effort to overcome our natural pet peeves. We do something nice for someone who irritates us. Giving Money: We choose to eat simple meals, or to fast junk food, and send the extra grocery money to someone else. There are many great organizations that truly give life to others. Giving Time: We fast our favorite TV show and instead pack the family up and visit the local nursing home. Giving Attention: We give up always having to talk about ourselves and give the gift of listening. Why Practice Lent with Children? This post is taken from Good Dirt: Lent, Holy Week & Eastertide. Lent begins on Feb. 18 with Ash Wednesday—we hope you'll join us on this journey! Lent is the season of the divine paradox. We must die to live. While the previous seasons of the church year burst with life, Lent brings us firmly to our deaths. Lent teaches us that the path of wholeness comes through sacrifice. Jesus himself said that we must die to live. Nature echoes this paradox. Seeds must die to live. Stars die to birth galaxies. It is the way of creation, and we are created. If we live in a constant state of indulgence we will never live a whole life. When we deny ourselves, die to our wants and needs, wholeness seeps into us and we live. Lent is our salvation from the superfluous. It seems Christmastide and Advent, with all their indulgences, are seasons custom made for children, but what about Lent? What do we do with children and death? Aren’t we to teach them to live? Herein lies the paradox. It is our job to teach them to live, but they must learn to die to themselves in order really to live. They must learn to die to having their own way, and they must learn to give what they have in order to receive what God has for them. We are to teach them to love themselves. The next step is to teach them to give up their lives. However, we cannot hope for that change in our children until we, their parents and teachers, embrace it ourselves. We teach them to die, by dying ourselves. So we also make a way for death. We clear the path, clean the space, and set our houses in order. That is what we do during Lent, as we participate in the three disciplines of prayer, fasting and giving. Together these disciplines do what we cannot do. They clear the path, clean the space and set our houses in order so that God can bring death and then wholeness. With all this death talk we may think we must walk around with sour looks on our faces. Not us, the people of God—the paradox kicks in, and we are joyful. Love makes Lent joyful. What we do, we do out of love for God and for neighbor. Lent is the season of the divine paradox: we must die to live. Nature echoes this paradox. Seeds must die to live. Stars die to birth galaxies. It is the way of creation, and we are created. While the other seasons of the church burst withlife, Lent brings us ﬁrmly to our deaths. As we observe Jesus’ walk toward his cross, we become aware of our own. As he said, we must die to live. Using our gardening metaphor, Lent is weed-pulling and tree-pruning. It is the decay of composted materials that will eventually enrich our soul soil. My (Lacy) gardening is a comedy of errors, except there’s not much laughing. Two springs ago I decided I needed a strawberry garden. I hauled over goat manure to mix into the soil before planting my tiny new plants, some ﬁfty of them. I painstakingly designed my watering system and dreamed of the mouth-watering delights that would soon be my reward. Boy, was I wrong. The little plants did grow, but so did the hidden enemy: the not-so-decomposed alfalfa seed in the manure. My Mom always said manure was nothing but grass and water; now I knew she was right. Since the manure wasn’t fully composted, along with my precious strawberry plants I inadvertently planted alfalfa. Somewhat digested alfalfa, but alfalfa nonetheless. In an alfalfa ﬁeld, alfalfa is good; in a strawberry garden, bad. I spent the remainder of the spring and summer and fall and until blessed winter came, pulling weeds. Everybody got a chance to pull weeds. Children, grandparents, visitors all took a turn in the strawberry garden. One hot summer afternoon I was pulling in this garden, which is ﬂanked by an old St. Francis statue that has been repainted by various children who seem to have gained their painting skills from the circus. I desperately wanted to burn the whole patch down, with ﬁre or chemical. All this work for a few delights that I could buy from the grocery store didn’t seem worth the eﬀort. I stared at St. Francis, giving him the stink eye, like all of this was his fault. He smiled his usual smile and continued to hold out the bread and wine. I persistently pulled those weeds while my mind drifted to spiritual practices. The eﬀorts that make our spirits strong and healthy are often like weed pulling. Confession, fasting, simplicity, submission are just a few that came to mind that afternoon. Eventually I began a routine of confession each time I stepped into that weedy holy ground. This confession was a conversation with God in which I could tell the truth about myself and tell the truth about God. © JD Warrick, used under Creative Common License. It's those bedtime questions that can require the very most we have to give. I remember hearing Chuck Swindoll say one time that for parents, it's those moments we're tucking them in when kids are the most talkative. Don't rush through bedtime with your kids, he encouraged. They'll do anything to delay switching off the light. Talk to them. Listen to them. Take advantage of their open hearts and listening ears no matter how tired you are and no matter how ready you are to be done with parenting for the day. Austin, my 11-year-old, asked this one as I was giving him a final kiss at the end of a trying day, to put it mildly. Our 8-year-old had been through two meltdowns, our high schooler had been home sick from school and then had gotten his braces tightened. We'd been to music lessons which meant a late dinner. The boys had been squabbling. Fishing poles and line were spider-webbed around our family room in an effort to de-tangle. And Austin and I had just finished studying for a surprise test. It was time for bed. "Mom, if Jesus asked God a question on the cross--'My God, why have you forsaken me?' --then how could Jesus and God be just one God?" The Trinity. Who really understands it? And how do I talk about it, and Jesus' most difficult moment here on this earth, to a tired pre-teen when I am feeling on the edge of sanity myself? Many times we've talked about the Father, Son, and Holy Spirit as 3 persons in one God, like an apple or an egg or a pumpkin--all different parts of one whole. That's the best way for our human brains to grasp what we can't really get. And this is what I pulled from down deep on this night. "Because the Bible tells us that Jesus cried out to God, we know he was talking to his Father. But the Bible also tells us that Jesus is God, and that the Lord our God is One. So, even though our minds have a hard time really understanding it, it's true. Someday we'll understand it much better." Now that I'm rested and the fishing poles are put away, I'm thinking a little more coherently. Not about my words to Austin, but about this place of mystery in our lives. The way we all deal with the unknowing that is an undeniable part of our Christian faith. As parents, and as people in relationship with God, we want to nail down the answers. We want to figure it out and learn it so we can defend it, and more, so we can live in an inner place of comfort. I'm reading a book that pokes at this tendency of ours to want neat and tidy answers. To beneat and tidy people. It's titled Chasing Francis by Ian Morgan Cron and is the fictional story of a pastor who has a breakdown of sorts and travels to Italy to encounter Francis of Assisi in his millenia-old surroundings. In talking with a few priests who are hosting him, the pastor begins to see his own unknowing, his own brokenness, with new eyes. "You'll never be able to speak into their souls unless you speak the truth about your own wounds," one of the priest says. "They want a leader who's authentic, someone trying to figure out how to follow the Lord Jesus in the joy and wreckage of life. They need you, not Moses." And then the priest says, "Do you know how Simon Tugwell described Franciscanism? He called it 'the radically unprotected life,' a life that's cruciform in shape. ... Maybe living the unprotected life is what it means to be a Christian." That night with Austin and a house full of tangle--it was the right night for a question without a good answer. It was the right night to remember Jesus' agony in relationship with his Father. And, perhaps my weary attempt was what it needed to be. The mystery of God, the cries of our suffering Servant, and the untidiness of me--they're things my kids need to see. And that image of the cross, I hope it comes to mind every time I'm spent and need to share just a little more of myself. *The TAU cross shape in the photo above is the one that Francis of Assisi used in all his writings, minus the head. He painted it on the walls and doors of places he stayed and used it as his only signature. The TAU is a letter in both the Hebrew and Greek alphabets and has long been used as a sign of the cross. This stained glass is found in the St. Francis of Assisi Parish, Sacramento, CA. "Call me by name oh Lord, when you call me into your kingdom!" In the last of our Lenten adventures we wanted to identify with people of a different race. Being multi-racial in our own family we had to stretch our imaginations a bit. So we went to a nearby ancient cliff dwelling national park called Mesa Verde. We have been there before and it is always interesting and fun to see and think about how people lived there. 7000+ feet elevation, 700+ years of civilization, farming, hunting, living to survive. This time was different though. We stayed on the Ute Nation reservation. Any person there could have told us what tribe they hail from. They could tell us stories from their ancestors. They could tell us their name and why they are named that. But the people that lived at Mesa Verde, that build these amazing feats of engineering (that have lasted for 2000 years), that survived in this area for over 700 years have no name. The government powers that be, have called them Anasazi for as long as I can remember but we now know that is a derogatory term from another large tribe in the area. So they are now called Ancestral Puebloans as ancestors of the modern tribes. However, no group claims this people now. They are nameless. Even the term "indian" that we use comes from the fact that the early explorers thought they had found the East Indies. We use it to classify many people that don't identify with that name personally at all! This astounded us. They have no name. Are they remembered? Are they valid? Are they significant in history? They were building a temple when there civilization stopped. Why did they stop building it? Who were they? We, in our culture, place so much value on a name. We named our kids very specifically for the meanings. They fit their names. We wear names on our clothing. We drive vehicles with names. We associate names with our foods. We know that the name "Donald Trump" stands for money and risk," McDonalds" is fast food, "Hawaii" is sun and beach, "Mercedes" is nice car, "Organic" is better for you. "It's just a name" does not apply in this day and age. We use names to identify, to classify, to differentiate, to recognize, to assign, to clarify. These people from Mesa Verde have no name? How is that? I could go on and on. HE calls us by name... HE changes our names to what HE knows us to be... HE names us! Our "Lenten Adventures" have taken our hearts to see that the homeless need to be seen, the religious are doing what they think is best for them and their families, that those around us that speak other languages can be beautifully accepting, and that we all feel the need to be named. I'm not sure that the kids see how this applies to their lives or their relationships with God, but I certainly hope it makes us better parents to teach them the characteristics of God. Rhythm, if there is something that I know it’s that some of us have rhythm naturally and some of us don’t. One of my favorite things of living in West Africa is the dancing, and maybe that’s cliché but it’s true. There is something so beautiful watching Africans dancing and every tribe or region has its very own dance. The music doesn’t matter, most often there isn’t any music, only the drums and that’s all that matters, the rhythm. Last week our campus celebrated the graduation of the discipleship training school and part of the celebration was dancing. In one particular dance, the African men would do the dance out front and then the women, both sets completely on time and amazingly agile. There were three non-Africans with them, whites to be specific, and they too joined in the dance. But it was quite a different dance. Not because they intended on doing a different dance but something in them couldn’t quite find the rhythm. They had fun and everyone cheered for them but the rhythm just wasn’t there. In Good Dirt, we talk about setting up a rhythm to doing the devotional with our children. Trying to set a rhythm to it and work it into our daily lives. Although we are four months into it, I have struggled over and over again to do a set rhythm and I have finally thrown my hands up in defeat. I can’t seem to get the attention of my children to do it more than once a day, actually that once a day is a challenge by itself. As I wonder if I am the only white girl who can’t find the rhythm in this figurative dance (because I am always that white girl in the real dancing around here) I realize that I am trying to dance my own families dance to someone else’s drum beat. Our family isn’t the formal type, we are not very good at specific set traditions; we are more the spontaneous, flexible family type. So I have had to come up with our own rhythm, starting with getting my two year old on my lap and getting her to ask Jesus to focus her heart, her mind, her eyes, her ears, and all of her on him, while pointing to each body part as she does it. Wow, it has worked wonders in getting her to engage in reading time. I have started to try to simply incorporate our talking to God throughout the day as I remember. It’s starting to look a bit more like a beautiful dance with God. I finally see it, it’s not a sloppy movement of good intentions, but rather a rhythm of dancing with God in the everyday sloppiness of our lives. Maybe I will only have to be the rhythm-less white girl in the actually dancing. Here is to each family finding their rhythm of dancing with God. When I was talking with Kaiser about what he might consider giving up for Lent (knowing he had no comprehension of a 40 day fast no matter how I worded it), he responded oh so quickly and with such certainty, “Mom, I don’t give up!” And he’s held his ground on that throughout. I have really been enjoying reading the Scriptures with my son each day. This month we stopped our morning reading unintentionally and I really miss it. We are getting back into the swing of good mornings again as spring blooms around us and our health is restored. Our evenings continue to be full of good conversations, though. I really appreciated Lacy’s “The Opportunity of Night” post – it’s the perfect time for heartfelt talk. It’s so good. Of course, with Kaiser “heartfelt” includes discussions on aliens and poopy diapers. And there are many, many nights where I’m too tired to answer his questions with any semblance of reality (usually because I’ve answered 3,568 similar questions throughout the day). But I know these times are precious and I know God’s Living Word is moving and working in the heart of my little boy. When we entered the season of Lent, I decided to forego facebook and coffee – two precious things to me – with the intent of looking to God more often and with more longing. I couldn’t have anticipated how deeply this last minute decision would impact me. This is my first time giving anything up for Lent (that I can remember – I think I’ll give up remembering things for Lent next year). And I’ve found that I miss coffee far more than I miss facebook. Missing coffee has turned the very center of my being into an ocean of longing – which I direct to Christ, allowing that longing to reach for Him instead of for coffee. It’s surprisingly physical, this longing. I feel it. Everyday. I smell coffee and I reach for Christ. I like it that Kaiser sees me giving up coffee. He knows that I really like it, so doors have opened up for talking about how this makes me feel. And I like having conversations with him about when we don’t give up – and when we do. Facebook has had a very different impact on this season of my life. Although it has been inconvenient at times (when I need to get directions to folks who are coming to my house for dinner and email or phone numbers haven’t been exchanged), it has been incomprehensibly freeing. My time isn’t bound by “catching up”. And my emotions aren’t on the roller coaster of cheering with friends who bought a new house one second and weeping with friends who lost a house the next. In all honesty, I feel anger and frustration more than any other emotion when I’m on facebook. I didn’t know that about myself until now. I like this freedom. It will certainly change the way I use facebook in the future. We don't travel long distances very much--partly because we've had young kids for the last 8 years, partly because we're definite homebodies, and partly because we already live in the most beautiful place in the world. But this past week we spent on a Disney cruise in the Caribbean, thanks to some very generous grandparents and a willingness to venture out of our comfort zone. And you know what I discovered? My view of God is so very small. I like to take classes, read books, do family devotions like Good Dirt--all things that help expand my definition of who God is. I learn about God's character, and I remind myself often that the God I serve is loving and generous and trustworthy and good. And yet every time I travel, I realize "my god" is still so very small. I know the God who travels back and forth to my kids' school with me 6 times a day. I know the God who helps me with my children and joins me while doing laundry. I know the God who exists in San Luis Obispo and that He loves the people here. But it is so easy to forget that "my god" is the very same God who loves rich people on Disney cruises. And He is the same God who loves people barely scraping by with servant jobs on Caribbean islands. And He is the same God flying with people in airplanes all over this world He created. He is capable of loving and being with every one of us at the same time. My God is so much more than I allow Him to be most of the time. A few weeks ago, my daughter asked me if five people were praying at the same time, could God hear all of them? Her definition of God is too small, just like mine. I told her that if five billion people were praying at the same time, God could still hear all of them. Even as I said the words, I knew it was next to impossible for me to believe, and I knew the look on Lauren's face said she doubted it, too. My prayer is that our family devotion times will expand our view of God, and help us to see more of who He is. God, we believe. Help our unbelief! Chocolate? Sodas? T.V.? What should I give up? Sharing with my newly 13 year old about Lent, these were the inevitable questions that were bound to come up. I knew that one day she would question why I give something up at this time every year and wonder whether she should do the same thing. I wanted to explain it in a way that would touch her heart and not leave her feeling as though this were just another trial to get through. But where to start? I was born and raised a Presbyterian but attended an Episcopal school though the elementary years. This taught me about the dichotomy between religion and faith. I watched my classmates who attended the Episcopal church “give something up” every year in the weeks leading up to Easter. I heard them talk about how hard it was to not have a coke when everyone else was having one or how they had messed up and it wasn’t worth trying anymore. I remember thinking “why did you try if it wasn’t worth it?” To be honest, I thought that the whole idea was just stupid. I mean, what do cokes and how many you drink have to do with Jesus? Not a thing as far as my grade school self could see. Fast forward a few years to the time when I was deciding what religion would serve my new family best. I wanted to raise my children in a church but I was left feeling as though something were lacking in all of the areas that I was seeking fulfillment. I chose Anglican to try out and it seemed like a good fit. A comfortable memory from childhood with real meaning. But then came Lent… and the concept of giving something up was staring me in the face once again. I looked past it for a few years, choosing to celebrate Resurrection Day without all the denial that came before. And I realized, the deeper I went into my Lord’s life and His sacrifice, that I was missing something crucial to the experience of Lent. By looking past the trials to the celebration I was not getting the full picture. I was fully embracing the worship portion of Easter without honoring Him with the surrender of something I was holding too dear. I started with giving up meat on Fridays. A simple enough sacrifice. Until you actually try to live it out. It’s hard in Western culture. And there is the point. I give up something that I have to actually THINK about. Not something that doesn’t cause me any discomfort at all. I give something up so that in missing that particular thing, or in having to think a little harder in consuming a meal on that day, I recall the sacrifice made my Lord made for me. And it makes me think. A lot. About His death. About His love. About why I am choosing to do this to honor Him in my own very small way. My sacrifice doesn’t equal His. It could never come close. But it can help me remember in a way that I might miss without that reminder. Every year, I now put much thought into what I might be choosing to sacrifice during Lent. Sometimes it’s very simple. Sometimes it is quite complicated. But it always reminds me of Jesus’ devotion to me. And in sharing with my children this year, the why’s became much clearer. It all comes down to a deeper relationship. I want to know Him more and this is one way I have chosen to do that. It may work for them or they may choose a completely different way to show that they understand His surrender. But He honors each heartfelt sacrifice. Big or small. Because our heartfelt sacrifices mean we are paying attention. And in the end that it truly all we have to offer Him. I've thought a lot about sin and how we define sin these days, especially with kids. I went through many hours of training with the organization Child Evangelism Fellowship, and we memorized a definition, with motions, for sin. "Sin is anything I think, say, or do that makes God sad or breaks his rules." In my years of church and Bible club teaching, I've used the definition countless times in explaining and reminding kids as we talk about sin and salvation. But over time I've tweaked the definition to make it one I think will speak to kids even better ... and will travel with them as they grow. "Sin is anything I think, say, or do that makes God sad because I'm doing it my way instead of God's way." We live in a Postmodern world where truth is thought to be relative and so right and wrong are simply matters of personal decision. Really, the words right and wrong don't have much of a place in our culture anymore. And while most young children don't have issues with understanding sin and their own wrong-doing, the world they live in will soon test their inborn convictions. All of these realities came to mind as two of my boys and I read John 7, a passage where Jesus stays away from Judea because the Jews are looking for an opportunity to kill him. "The world ... hates me because I testify against it that its works are evil" (v. 7). As we used our Good Dirt devotional we talked about why people don't like admitting they are wrong. And we talked about the discipline of Confession, telling God the truth about ourselves. We took some quiet moments to pray silently, each of us, confessing our sin to God and asking for forgiveness. It was good time. Often in the past I have prayed with the boys before bed and asked God to forgive "us" for our sin from the day, knowing that we can only ask forgiveness for our own selves, but hoping my boys will take to this prayer of confession and make it their own. How much better, though, to let the quiet give them a place to do it personally, right here and now. How often we forget even to acknowledge sin and ask forgiveness. It's so easy, on our own and with kids in prayer, to ask for things and thank God for blessings. We're forgiven once and for all through Jesus' death on the cross. But we still struggle with sin in this life. Paul talks about it often in his letters in the Bible. Without regular confession of sin, and the receiving of God's forgiveness, our hearts can't stay tender and humble, letting God be God. I recently heard the author of a children's Bible speak on the radio. Sally Lloyd Jones (The Jesus Storybook Bible) talked about how we can explain sin to children. "It's like running away and hiding and thinking you can be happy without God, but God knows there is no such thing." "It's a poison that makes your heart sick, so it won't work properly anymore." When Jesus came to walk the earth and live with people, he was all about the heart. Everything we do and are is an overflow of the heart, Jesus stressed again and again. The heart can't be happy without God. And the heart can't be healthy without God. May we, and our kids, guard our hearts every day by telling on ourselves. We need the discipline of Confession. It will travel with us as we grow. So our Lenten season this year will be a bit different for us. We have in the past fasted as a family things like meat, media, other items from our lives that are "unnecessary." However, this year as Mike and I are frequently reminded how spoiled we are and we are constantly telling our kids how spoiled they are, we are trying something new. We both have travelled both to places where things are easy and where things are not so easy. We consistently find happier more satisfied people in places that struggle. Here in our Colorado lives where the sun shines and we are warm, fed and clothed we feel as if we struggle when we are looking to ourselves and our things or at our "neighbors" for our fulfillment. So begins our season of Lent. As we were looking toward this season of penitence we asked our kids about what they might feel led to fast. Isabella decided on her own to fast pizza, ice cream, chocolate and peanut butter. Since the rest of us probably could not survive without 1 never the less all 4 of these things we are letting her fast these things alone. To Quinn we suggested he fast hot sauce as he literally has an addiction but you would have thought we asked for his arms...so we let this go too. Kadin is 4 and if it is out of sight it is out of mind so fasting for him is not too difficult since he just goes on to the next thing. Mike and I just came off a fast from last month for another thing we have chosen to do. All this to say we aren't fasting. We have decided to make our season of identifying with Jesus' sacrifice also a season of identifying with certain people groups around us. We have chosen 4 different people groups to delve into their lives. The 1st is those that live where they do not speak the language. In our tiny town of 2000, about half are Spanish speakers. Mike calls it "little Tijuana". I sometimes find myself thinking that "They should learn English!" That confession out there... these are the 1st we are recognizing. On Sunday we attended a Spanish mass, then went to an authentic Mexican restaurant. I know that you are thinking that doesn't sound like much of a struggle. It wasn't. I must confess...we loved the service and we loved the restaurant. The church was standing room only and the restaurant we were recognized because we frequent the establishment. We used our tiny vocabularies of Spanish words to follow the mass and to order food. What brought it home for us was that we stood out! We were definitely the odd balls in both places and everyone knew it. We were not unwelcomed or treated unkindly. Quite the opposite! Quinn did say that if he couldn't understand his coaches or his teachers it would be "totally hard!" But it makes him understand his teammates Juan and Sergio better and why they don't talk a whole lot. We have plans for 3 more weeks of recognizing hardships of others...of putting ourselves into their lifestyles and into their situations. We could do this for many many months without exhausting a supply of groups. We are praying that our kids realize how good they have life and that we remember that our battles in this life could be so much harder. We all need to remember that ALL good things come from God and that to HIM and HIM alone are we to be grateful. Our home has not been very peaceable this month with the stresses of illness and an unexpected hospital stay. Yet our hearts have known peace. Peace came with every prayer you uttered on our behalf. Thank you. Oh, thank you for those gifts. I long to be an instrument of God’s peace. But I’m not always ready. I want this season of Lent to be a season of being ready. May the Lord cut through my fundamental understanding of what peace looks like and how it needs to be brought to the hearts of those around me. May my son recognize the effects of God’s peace and become a herald of it. For about a year, the wallpaper on my phone said simply 2 words: be awesome. As cheesy as it is, there was something about that phrase that struck me--in a good way. Because there are so many things in this world that aren't awesome, and yet they are able to take up so much of our time, money, and thoughts. It was my reminder every time I turned on my phone to return to what is awesome. For some reason, this is what came to my mind the other day when my 8-year-old asked, "Mommy, why do people give up things for Lent?" Now, this blog already has some awesome explanations of what Lent is and how to celebrate it with children, so I won't repeat all of that here. But I can tell you the answer I gave to my daughter. I fast from something in Lent because it is an opportunity to let go of something that isn't awesome. Something that has crept into my life and taken over in a way that keeps me from living my best life with God. It's a chance to create a new habit or give up an old one and turn our lives back in the direction we're wanting to go. Because everything is not awesome, and we have the ability to choose what will be a part of our lives. So what am I giving up for Lent? In a word, shopping. If you know me in person, this may surprise you, as I am a fairly... frugal person. But giving up shopping for Lent is more about my time and less about my money. Because, as a homemaker, much of my responsibilities involve spending our money in the best possible way. And a cheap perfectionist can spend hours trying to find the absolute best deal on everything. So I have found my days have gradually become more and more about searching for deals and coupons online, driving around to different stores to buy everything at the best price, and even occasionally rewarding myself by wandering through the aisles of Target or World Market while the kids are in school. And while I don't think any of those things are necessarily bad in and of themselves (and it is certainly important to be good stewards of our money), they are not the best way for me to be spending so much of my time. I think God is far more concerned with how much time I spend with Him and serving others than with how many dollars I saved on my last shopping trip. So I am receiving Lent as an opportunity to make changes in my life. I will still do the grocery shopping every week (because it's my job!) and I will still buy the necessities that my family needs. But no online shopping for me, no window shopping, and no hours spent in search of the best possible deal ever. I see it as a chance to take back some of the hours in my day and an experiment in being more awesome. What about you? Have you asked God what He would like you to give up for Lent? Are your children participating this year? I really would love to know--and feel free to ask me how the shopping fast is going. Have a blessed Lenten season. Family Altar or Prayer Corner: Cover a small table with a purple cloth,. Arrange on it a cross, or a family Bible, maybe a small shallow box with sand in it, where children can draw their prayers to God, maybe a family prayer journal. Choose a Christ candle to place in the center. (Battery powered candles are wonderful for the not yet fire worthy.) Invite children to light the Christ candle in the morning or evening, or when you are reading the Bible as a reminder that Jesus is the Light of the World. This is the light of Advent that continued through Christmastide and Epiphany--and still shines on in Lent. Invite family members to visit the Altar at least once a day during Lent.